City Council Environmental Justice Hearing. February 28, 2014. 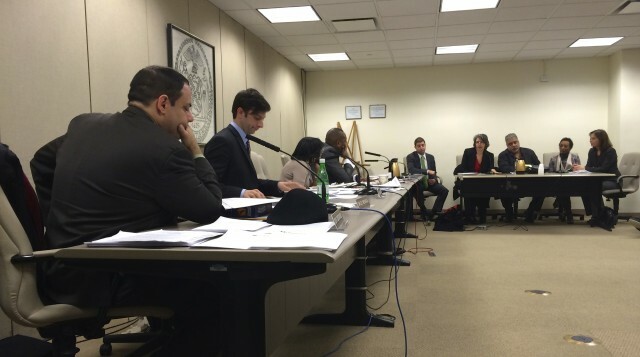 On February 28, 2014, CUER Director Rebecca Bratspies testified before the City Council Environmental Committee. According to NYC-EJA’s Eddie Bautista, this hearing was the very that the City Council has held on environmental justice. Lengthy testimony from DEP Director Carter Strickland focused largely on city-wide improvements in air quality. Professor Bratspies was on a panel with Eddie Bautista from NYC-EJA, Peggy Shepard of WEACT, Frederica Perera of Columbia’s Center for Children’s Health, and Michael Sailback of the American Lung Association. All pressed City Council Environmental Committee Chair Donovan to demand better and more fine-grained environmental information about air quality in EJ communities, as well as to create more opportunities for public participation in environmental decision-making. (Professor Bratspies also took the opportunity to talk about Mayah’s Lot and to enlist City Council support for PS85Q’s stop the noise campaign). Somewhat ironically, the environmental justice hearing was packed with upper East Side residents angry about the siting of a waste transfer station in their neighborhood as part of the 2006 Solid Waste Management Plan provision intended to remedy decades of environmental injustice in the siting of those facilities.